Can I just say you all are so smart. I was really surprised that so many of you knew what my What Is It Wednesday was for last week. 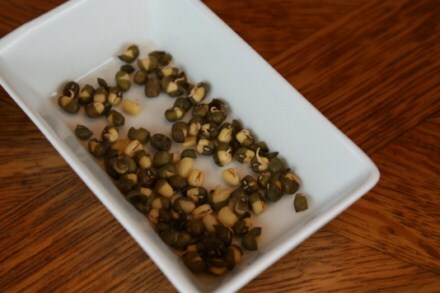 Those of you that guessed mung beans were right, they were sprouted mung beans to be exact. But now I need your help. I bought these without really thinking about what I would do with them. I really had no clue, and I did not buy very many of them. I did not think about the fact that I would need a pound or at least a half of a pound to make anything. So, I only bought a few. When I started researching sprouted mung beans to decide what I would make using them, I realized that I needed more than I bought. I do plan on getting some more next time I go to Whole Foods, so that I can make something with them, because I really do want to see what mung beans are like. Now, I need ideas though. Several of you left ideas in the comments, but I would love to have more recipes and ideas about how to use them. If you have eaten or cooked with them before, I would love to have your thoughts. I have only cooked with sprouted mung beans. You should be able to use the unsprouted ones in place of lentils; but I am fairly certain mung beans are popular in Chinese cooking, so you might want to look in a Chinese Cookbook. Let us know how they turn out, whatever you choose! Personally, I think they taste better sprouted. I would sprout them and add them to a noodle dish or salad dish.